After year-on-year increases from 2007 to 2009, the number of corporate insolvencies fell in 2010 and 2011, by 4.5% and 1.5% respectively. However, with the French economy stagnating since 2012, the insolvency trend reversed again. In light of the modest economic rebound forecast in 2015, a meagre improvement of the insolvency environment is also expected. 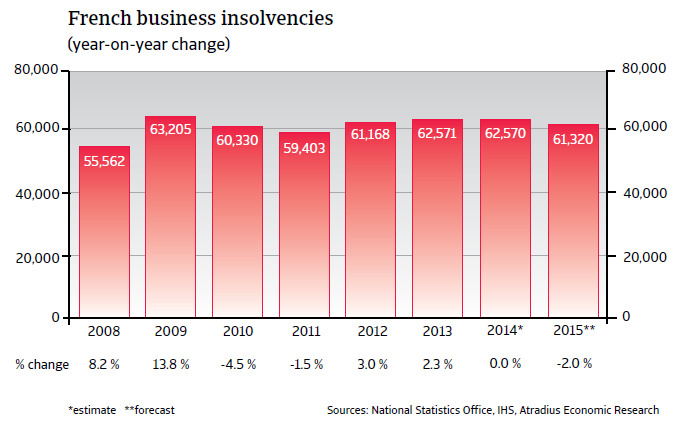 However, with more than 62,000 expected, the number of business insolvencies would still be more than 20% higher than in 2007. According to the French National Institute of Statistics and Economic Studies (INSEE), real GDP grew 0.4% in 2014, making it the third straight year of subdued economic growth. Household consumption growth remained modest, while investments decreased and net foreign trade weighed down GDP growth by 0.4%. 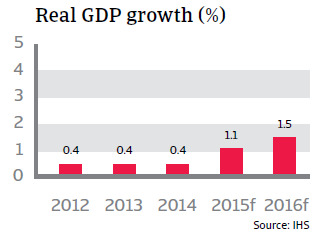 In 2015 the French economy is expected to grow 1.1% as private consumption, manufacturing and exports improve. However, this projected growth rate remains below the forecast eurozone average of 1.4%. Consumer confidence has picked up since mid-2014 amid expectations of an improvement in the economy. Nevertheless, concerns remain over the labour market situation. Unemployment increased again in Q4 of 2014, and was high at 10.3% last year. 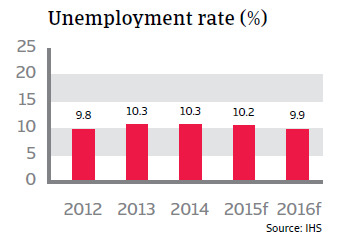 In 2015 only a modest decrease is expected. 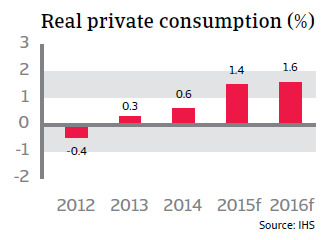 Private consumption, traditionally a major contributor to French economic growth, grew just 0.6% in 2014. 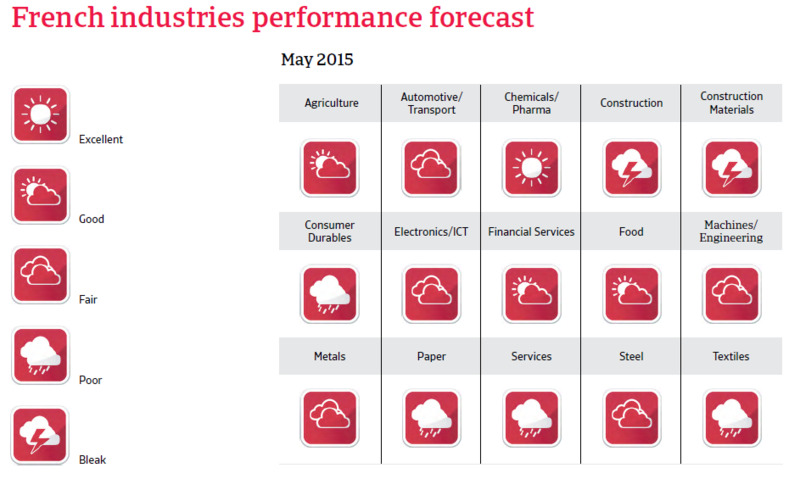 However, it is forecast to increase 1.4% in 2015, boosted by decreasing consumer prices. French industrial production decreased 1.0% year-on-year in 2014, but has shown signs of a rebound in recent months, bolstering hopes that overall economic growth will see some support from manufacturing. Business confidence has picked up again since the second half of 2014, but still lies below its long-term average. 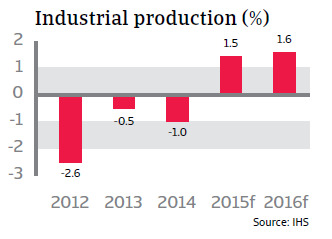 In 2015 industrial production is expected to grow by 1.5% and by 1.6% in 2016. While this is a positive sign after three years of contraction in industrial production, the forecast rebound is still not enough to offset the decreases from 2012 to 2014. Investments decreased again in Q4 of 2014 after decreasing every quarter since early 2012. Economic uncertainty, particularly regarding the government’s economic policy on corporate tax burdens and social charges, together with low profit margins, has led many French businesses to put investment on hold. 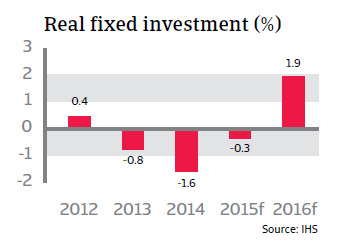 Real fixed investment is expected to decrease again in 2015, by 0.3%. Following last year’s 2.7% rise, exports are expected to grow 4.6% in 2014, helped by the lower euro exchange rate and increasing demand from France’s European peers. However, this export growth rate still remains below the forecast eurozone average. With its international competitiveness diminished, France’s share of global exports has decreased by a third since 2002. 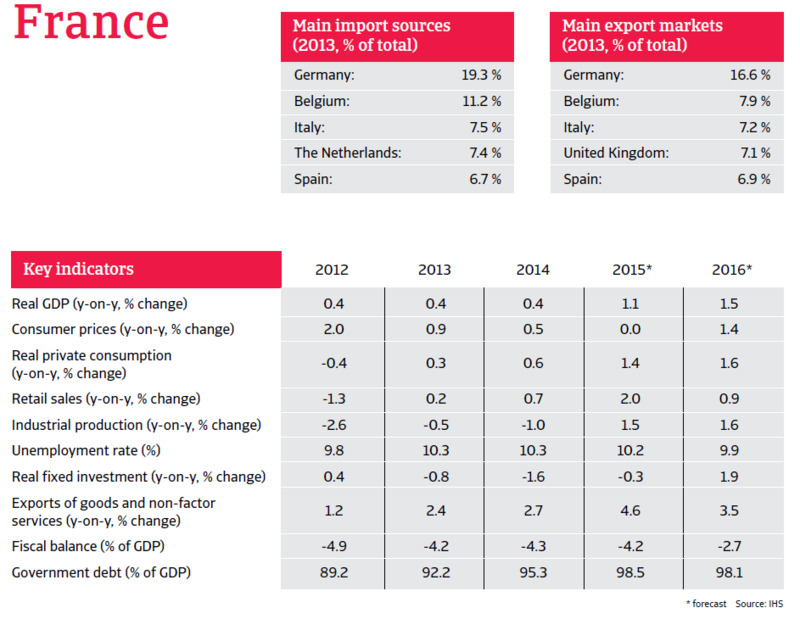 Will France miss the Maastricht deficit targets again? The 2008 credit crisis, subsequent government stimulus measures, and France’s only modest recovery have led to a sharp increase in public debt in recent years, up to 95% of GDP in 2014 from 66.7% of GDP in 2008. The government’s fiscal deficit in 2014 was 4.3% of GDP, and the French government has repeatedly missed meeting the Maastricht deficit threshold of 3% of GDP. 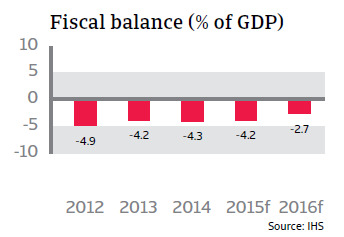 In 2015 it is expected that the fiscal deficit will again fail to meet the 3% goal, exceeding 4% of GDP, despite the fact that the French government originally aimed for a deficit of 3% of GDP. Despite some austerity programs more measures to curb public spending are required, especially as, at 57% of GDP, public spending in France is the highest in the eurozone. In March 2015, the European Union finance ministers granted France an extra two years to bring its budget deficit within 3% of GDP, as mandated by EU regulations. The decision was controversial given it was the third extension that France had been granted since 2009, sparking accusations that larger core EU member-states are treated more leniently than smaller peripheral ones.